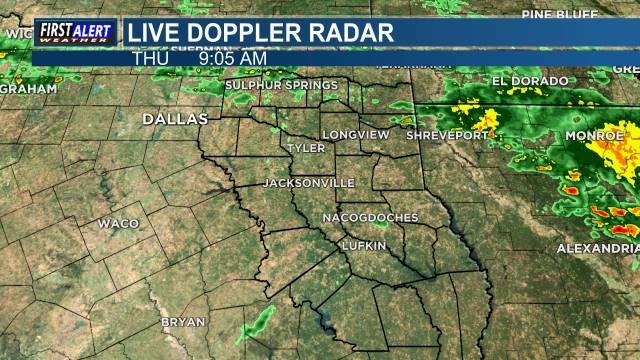 East Texas (KLTV/KTRE) - Here’s the weather where you live: Starting our afternoon with cloudy skies and some patchy drizzle and light scattered showers across the region with temps in the mid to upper 50s and lower 60s. Heading into the afternoon, temps will slowly rise but aren’t expected to get very warm, only expected to see lower 60s in most areas with Deep East Texas possibly reaching into the mid to upper 60s. Chances for rain today will increase as we head into the evening hours due to a weak cold front that will begin to move through East Texas. Rain chances will persist into early Saturday morning but will eventually dry out as we head into Saturday evening. Sunday we will finally get a good look at the sun for the first time in a while, with mostly sunny skies and temps in the mid 60s. Heading into next week, temps will start off in the lower 60s and will start a slow warming trend as cloud cover and chances for rain increase.